Okaloosa Island is located between the mainland of Ft. Walton Beach and Destin. The island is comprised mostly of condominium buildings, private homes and hotels, with a few retail shops, restaurants, bars and convenience stores thrown in. The island has some fun attractions also, such as the Gulfarium Marine Adventure Park, Wild Willy’s Adventure Zone, the “Boardwalk” (where you will find several good restaurants & retail shops) and the Okaloosa Island Fishing pier. Just to the east about 6 miles lies Destin, which offers many more options for dining, shopping and entertainment. On Okaloosa Island in Ft. Walton Beach Dune Pointe is a small building with just 20 units. The building has an elevator and heated swimming pool as well as a private beach. 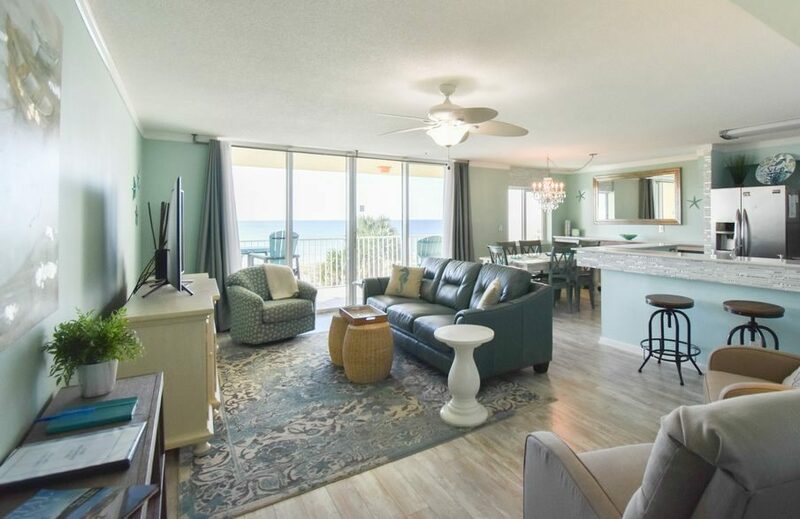 Each condo has a large balcony that overlooks the pool, the beach and all have a gorgeous view of the emerald green waters of the Gulf of Mexico. 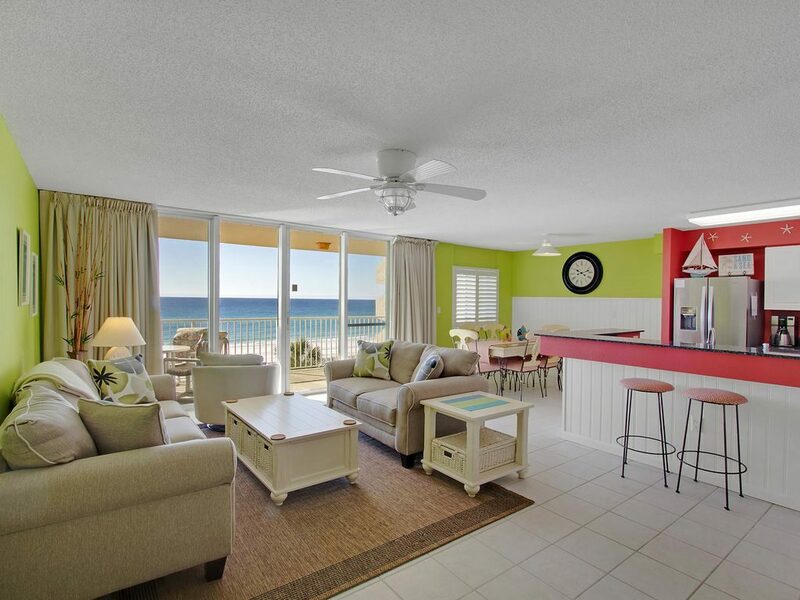 Our spacious 2 BR/2 BA beachfront condos can each sleep 4 adults & 2 kids or 1-2 adults & up to 4 kids. 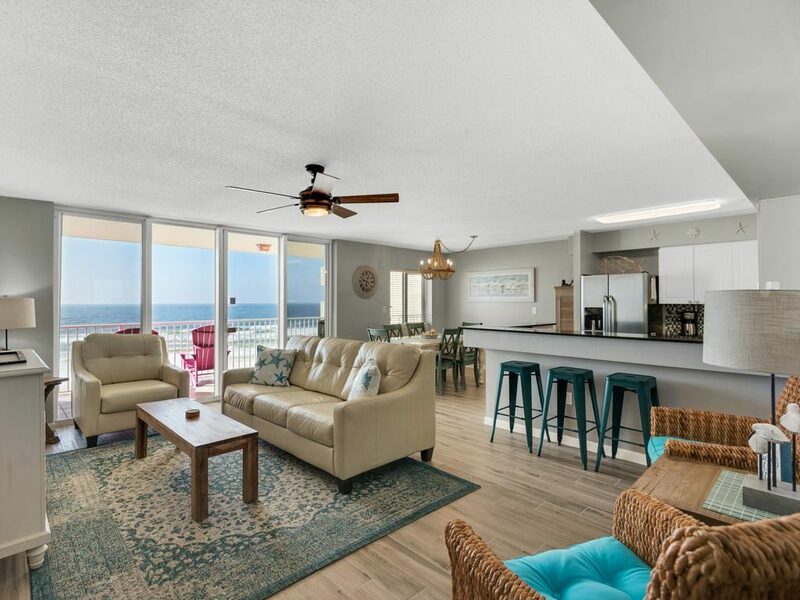 We love the Dune Pointe Condominium building because at 1284 square feet the units are some of the most spacious that we found during our property search. There is plenty of room to spread out and relax without feeling cramped or on top of each other. Because of this building’s location (directly on the beach) our guests have access to the beach just a short walk over the dunes using the private walkway. You will not have to pack up your car to drive to a public beach access, nor carry your equipment, coolers, etc. across a road to the beach. As a service for our guests, your stay at Beach Escape includes a reservation for two beach chairs and one umbrella set up each day on the beach just for you (March 1 through October 31). Beachfront vacation rental condo on Okaloosa Island, FL with a direct Gulf view! Perfect for small families or 2 couples traveling together.